Virtual events are a trend that won’t be going away and are quickly becoming a strategic must for associations. Virtual events can reach deep within organizations and impact a larger number of participants. Traditionally, only a select group of individuals are able to attend in-person events, leaving a majority with nothing. Virtual events are evolving the way associations offer education, are cost-effective, powerful and an efficient way of extending your most compelling content to your entire community. 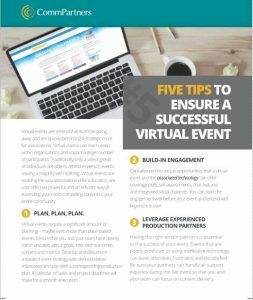 Download this resource for five tips to ensure your next virtual event is a success. Are you currently planning a virtual event?